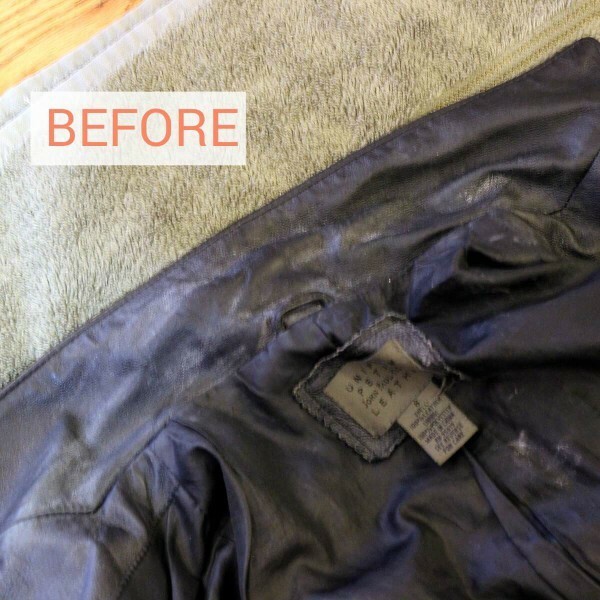 You may think you have to take leather clothing (real or faux) to a professional cleaner, but that’s not necessarily true. 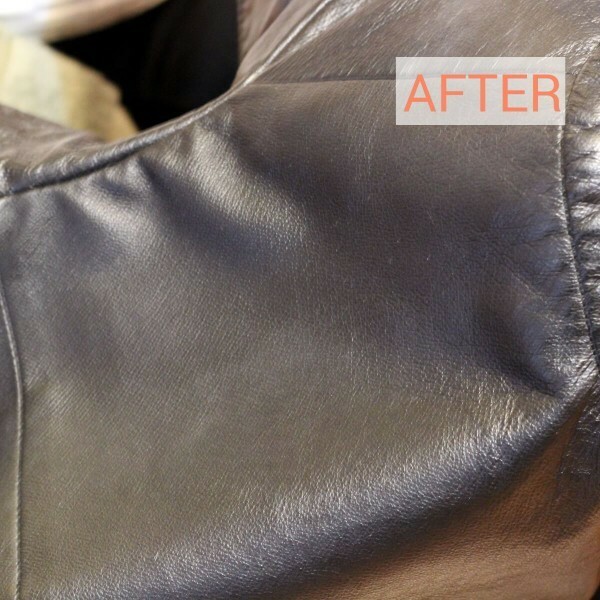 Most spot leather cleaning can be done at home with a product you may already have on hand. Here you see the collar of a leather jacket I’ve worn every winter for many years. The collar goes against my neck and gets my natural oils, plus hair products and moisturizer on it. That leaves a nasty whitish film which was actually sticky to the touch. I know – gross, right? 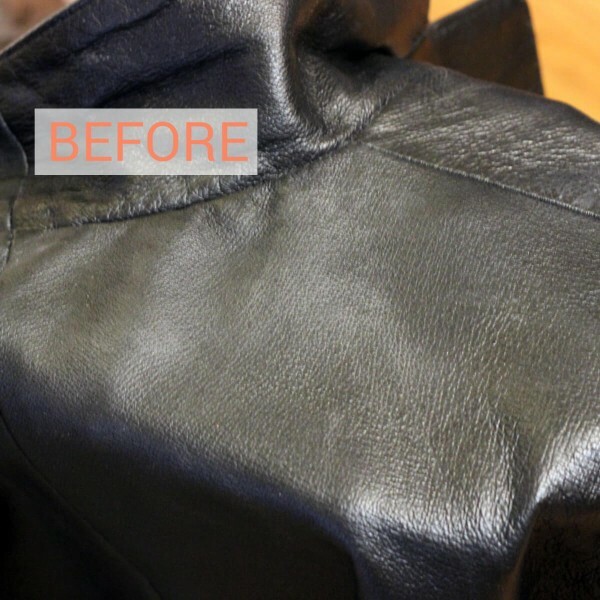 Now, there are a lot of theories about how to clean leather (and faux leather), and most of them involve not getting the leather wet. They also talk about how delicate leather is, as if it’s not famous for holding up to decades of wear and tear. But leather jackets get rained on all the time. 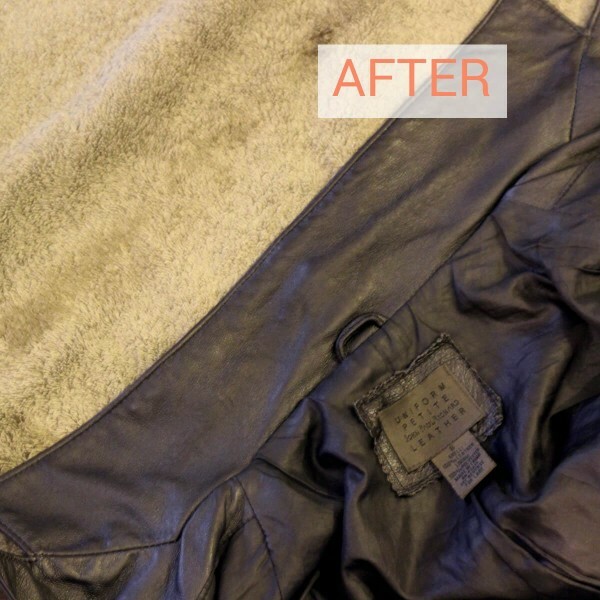 Leather may not stand up well to being soaked for long periods, but it can definitely handle getting wet, especially if you dry it quickly. I think it’s much more important to use a gentle solvent and make sure it’s fully removed than to worry about a little bit of water. So this is the way I’ve cleaned this jacket for years, and it works for me, and the jacket looks like new when I’m done. This method should also work on leather (faux or real) furniture, purses, etc. Take a cloth and dip it into the diluted baby shampoo mixture just enough to get it damp. Scrub the dirty area – I use circular motions and not a lot of pressure. Take another cloth which is barely damp, and quickly buff over the areas where you used soap. Take a towel, and quickly buff over the same area to remove some of the dampness. Let it dry somewhere inside your home – not out in the sun. It’s that simple. And for really small spots that haven’t really ground into the leather, you can often just use a dry cloth.